Replaces the Bear, Snow Bear, Wolf, and Snow Wolf ingredients so that they look like pelts instead of mutilated heads. If you use the icons, meshes, and/or textures, give me credit. The meshes are Bethesda's, modified by Heremod (not sure exactly how, if at all), and then by me. You can use the textures and icons for a game like, say, TESIV. You must credit me. You cannot use the meshes for TESIV because they are Bethesda meshes, and Bethesda has expressed extreme disapproval at using their TESIII stuff in TESIV. Thanks to Bluehair for creating the DDS Converter (freeware). Thanks to Adobe for creating Photoshop. Thanks to the folks who created Irfan View ( http://www.irfanview.com/ ). Thanks to CGTextures for an astonishing array of marvelous free textures ( http://www.cgtextures.com/ ). This mod changes the meshes and textures of the wolf and bear ingredients so that they look like pelts/hides instead of chopped-off, gory heads. 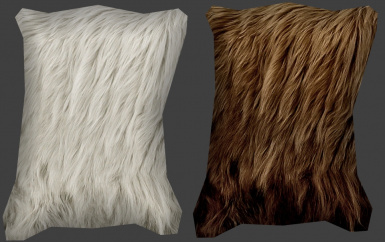 Now you can decorate your homes with luxurious fur pelts. The meshes are the same as the pelts decorating the walls, but the textures are completely new. All textures are hi-res, 512x512 in .dds format. Custom icons with alphas (transparency) are included. Does not require an .esp. + Heremod Production's "Realistic Pelts" mod inspired me to create my own version. I used the meshes from his/her mod, but the textures and icons are completely new. + To get the pelts decorating the walls to look as pretty, download my Bloodmoon Pelt Replacer mod. - made the gray wolf pelt use the same mesh as the white wolf pelt. Now the wolf pelts have one type of mesh, and the bear pelts have a bigger, slightly different-shaped mesh. 4. Start Morrowind Launcher and play. 1. Remove the previous version's textures. 2. Add the new version's textures. 3. Start Morrowind and play. There is no effect on saved games and shouldn't corrupt any saves. This mod will conflict with another mod that modifies the exact same textures, icons, and meshes (see the "Uninstall" section for the names of the files contained in this mod). This mod IS compatible with mods that modify the properties of the hides - such as mods that change price, name, weight, alchemical properties. Heremod's mod will take precedence over this one because it uses an .esp. I don't know if there will be conflicts if you attempt to use both at once. 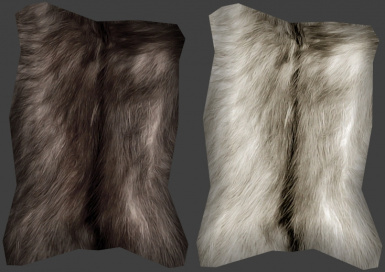 I would suggest removing the files that came with Realistic Pelts if you want to use my mod. None that I am aware of. If something is wrong, let me know. 2.1, 2010/12/12 - slight tweak to the meshes. Screenies not updated, though they should be. 2.0, 2010/12/12 - updated and improved. 1.0, 2009/01/01 - Initial release.